Tag Archive | "The Wealthy West"
In the spirit of all things amorous, cynical Texan artist, The Wealthy West, aka Brandon Kinder of indie rock band The Rocketboys, is offering a free download of “Love Is Not Enough” from his Volume 1 EP. 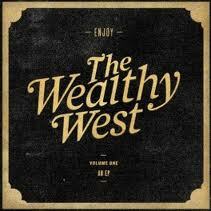 The Wealthy West will perform at Swan Dive in Austin, TX on March 30th. Brandon is also in the studio with his band The Rocketboys who are working on their next studio album, due out later this year.